The energy, enthusiasm and ideas shared at this Annual Leadership Meeting represent all we can achieve together in the coming year. Smile Brands Inc., a leading dental support organization (DSO) with 400 locations across 17 states, hosted over one thousand people at its Annual Leadership Meeting January 11 – 13 in Dallas, Texas. 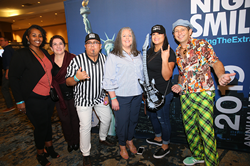 The event brought together some of the nation’s best general and specialty dental providers, practice managers and industry suppliers to celebrate the success of Smile Brands affiliated practices in 2018 and share goals for 2019. For the second year in a row, Smile Brands was the only DSO to be named a Best Place to Work in the Glassdoor Employee Choice Awards. The Annual Leadership Meeting is just one of many activities the organization sponsors throughout the year to create a win-win culture for its affiliated providers and employees. For the first time, a group of graduating dental students was invited to experience Smile Brands’ culture first hand. The meeting featured a variety of continuing education courses delivered by top dental industry experts for Smile Brands affiliated providers, plus information and best practice sharing to help all affiliated offices reach new heights in 2019. Some of the most important learning actually happens outside of the scheduled sessions where attendees are afforded the opportunity to network and share ideas and best practices. Dr. AJ Acierno, CEO of DecisionOne Dental Partners, and Dr. Matthew Welebir, CEO of P3 Dental Group attended the meeting for the first time. Based in Irvine California, Smile Brands Inc. is one of the largest providers of support services to dental groups in the United States. Recently ranked #25 on Glassdoor’s 2019 Best Places to Work list, Smile Brands Inc. provides comprehensive business support services through exclusive long-term agreements with affiliated dental groups, so dentists can spend more time caring for their patients and less time on the administrative, marketing and financial aspects of operating a dental practice. Smile Brands supports nearly 400 Bright Now!® Dental, Monarch Dental®, Castle Dental®, A+ Dental Care, OneSmile Dental, Johnson Family Dental, P3 Dental Group, and DecisionOne Dental Partners offices in 17 states. Smile Brands is a portfolio company of Gryphon Investors, a leading middle-market private equity firm based in San Francisco, Calif. For more information, visit http://www.smilebrands.com.